LS Polls 2019: Rahul Gandhi, Priyanka Gandhi Vadra and West UP in charge Jyotiraditya Scindia will jointly hold three rallies in the state. LS Polls LIVE: “Bahar se laenge, basaenge,hum sote rahenge?Hum iska muqabala karenge,370 ko kaise khatam karoge?Allah ki kasam kehta hun,Allah ko yahi manzoor hoga,hum inse azad ho jayen.Karen hum bhi dekhte hain.Dekhta hun phir kon inka jhanda khada karne ke liye taiyar hoga,” says Farooq Abdullah on Art 370. LS Polls LIVE: “For now the program (Rahul Gandhi-Priyanka Gandhi Vadra’s rallies) has been cancelled at all three places (Shamli, Bijnor, Saharanpur), due to bad weather. We are planning Priyanka ji’s road show tomorrow,”said Imran Masood, Congress’ candidate from Saharanpur. LS Polls LIVE: “Did PM even give a single penny for West Bengal? The person who makes such big claims must see what he has contributed towards Bengal. He was busy in foreign tours for five years and now he saw the need to come here,” Mamata Banerjee said while addressing a rally in Cooch Behar. LS Polls LIVE: “The difference between BJP manifesto and Congress manifesto can be seen firstly from the cover page. Our’s has a crowd of people, and BJP manifesto has face of just one man. 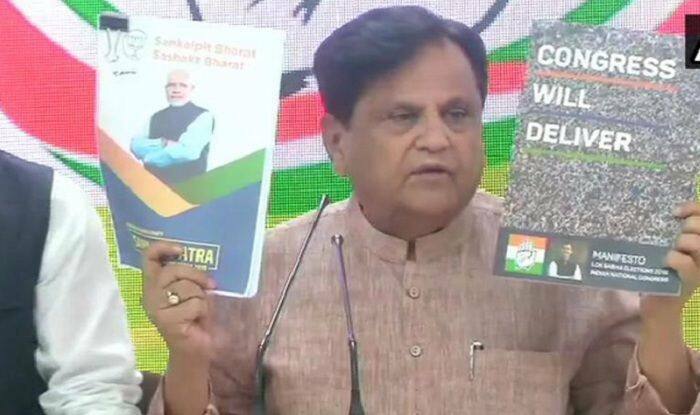 Instead of a manifesto BJP should have come out with a ‘maafinama’,” said Congress leader Ahmed Patel. LS Polls 2019: Rashtravaad hamari prerna hai, antoydaya hamara darshan hai aur sushasan hamara mantra hai. Desh neeti chalane ke liye hume multi dimensional level par kaam karne ki zarurat hoti hai aur humne use sankap patra mein shaamil kiya hai (Nationalism is our inspiration, uplifting the marginalised is our vision, good governance is our mantra. To run a national policy we need to work on a multi-dimensional level and that has been included in a ‘Sankalp Patra), PM Modi said. LS Polls 2019: “We have set 75 well-defined resolutions in our manifesto that we can fulfill in a time bound manner. We are moving forward with ‘one mission, one direction’, PM Modi said. New Delhi: Congress president Rahul Gandhi and his sister Priyanka Gandhi Vadras scheduled rallies in the Western region of Uttar Pradesh have been postponed following bad weather conditions. The Congress leaders were expected to address rallies in Saharanpur, Shamli and Bijnor districts, where the polling is scheduled to be held in the first phase i.e. April 11. “For now the program (Rahul Gandhi-Priyanka Gandhi Vadra’s rallies) has been cancelled at all three places (Shamli, Bijnor, Saharanpur), due to bad weather. We are planning Priyanka ji’s road show tomorrow,”said Imran Masood, Congress’ candidate from Saharanpur. Further, the party is also expected to hold around 18 major rallies in the state that would be jointly addressed by Rahul and Priyanka, ANI reported. Former prime minister Manmohan Singh is also likely to address a couple of poll rallies in Pilibhit and Kanpur that have sizeable Sikh voters. Saharanpur, Kairana, Muzaffarnagar, Bijnor, Meerut, Baghpat, Ghaziabad, and Gautam Buddha Nagar constituencies will go to polls in the first phase on April 11. Uttar Pradesh is witnessing a triangular contest this time. The BJP-led NDA which had won 73 out of the state’s 80 seats in 2014 is facing a tough challenge from the Congress and the SP-BSP-RLD alliance in the state. The SP had won five seats in the 2014 elections, the Congress two and the BSP and the RLD nil. Meanwhile, the Bharatiya Janata Party (BJP) released its manifesto for upcoming polls today at party headquarters in the national capital. The ‘Sankalp Patra’ was launched in the presence of Prime Minister Narendra Modi, party president Amit Shah, Union Ministers Rajnath Singh, Arun Jaitley and Sushma Swaraj.